Actions from the game, FC Halifax Town v Grimsby at the Shay. Danny Schofield. 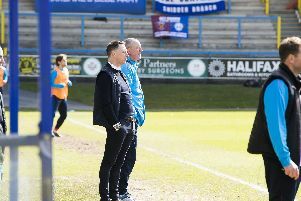 Danny Schofield believes togetherness is the key for FC Halifax Town in the race for the play-offs. Town’s hopes of a top-five finish took a hit when they lost 1-0 at Southport on Tuesday night. But they are only seven points off the top-five with four games in hand over fifth-placed Forest Green. Schofield has experienced two promotions in his career, once under former Halifax defender Peter Jackson at Huddersfield and also under Kenny Jackett at Millwall. The 34-year-old reckons it was crucial Town supplemented their squad with their recent new signings and says a collective spirit is now key. “The gaffer had added to the squad in recent weeks which I think is vital for the play-off push,” Schofield says. “It’s about togetherness. We’ve got numbers in the squad now but whether you are playing or on the bench we’ve got to stick together. “But we need to be more adventurous and creative up front. Schofield admits Town were below-par in midweek but remains optimistic about the club’s position and says a good run of form can steer them back into the play-off places. “It wasn’t a fantastic game (at Southport) or a fantastic performance by us and it was a disappointing result,” he says. “We were confident going into the game to pick up at least a point but that’s football. “I don’t think over the last couple of games we have performed to the level we are capable. “It’s hard to put a finger on why that is. “I’ve been in football a long time now and it’s full of ups and downs but we haven’t been good enough lately. “After a couple of bad performances you’ve got to take the positives out of it. “We’re still in a good position and we’ve got games in hand. Schofield has no doubts the Halifax squad is good enough to finish in the top-five, but says they must remain focused ahead of a jam-packed end to the campaign. “There’s a lot of ability in the squad,” he says. “The players have got the ambition to get to the Football League. “Everybody wants to test themselves as high as you can. “We’ve shown we can bet anyone in the league on our day but teams lower down can also beat anyone on their day too. Schofield says he and fellow former Huddersfield man Matt Glennon have an important role to play as elder statesmen in guiding the younger players through the rest of the campaign. “It definitely helps,” Schofield says. “Experienced players can play a big part with the younger ones. “Sometimes they do look up to you for that experience and to drag them along through difficult situations. “At Huddersfield we got the last spot over the last couple of games so when it’s still mathematically possible you should still plug away. “It’s a fantastic experience getting promoted through the play-offs. “The players are good enough, we just need to get back to playing the way we were before the last couple of games.